The Lahmers Family takes pride in the work we do providing premium Grade A milk and dairy products from our farm straight to your table. Our milk comes from the most sanitary conditions possible. We oversee the entire process from milking the cows to stocking your store shelves. We specialize in the production of the easier to digest, 100% pure A2 milk. This low temperature, vat pasteurized milk and dairy products are exclusively produced from Buckeye Country Creamery. The A2 Milk produced by the family owned and certified A2 cows has natural health benefits and a better taste. 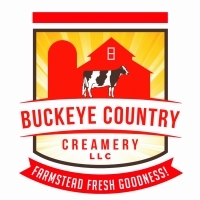 The Buckeye Country Creamery takes pride in producing premium, natural and American made dairy products. We produce REAL whole milk exclusively from our own cows, which are selected, because they have a natural protein not commonly found in all cows. The result is Buckeye milk that is easier to digest. The Buckeye A2 milk is also processed exclusively in our own creamery operations on the farm. Our milk is Vat Pasteurized at lower temperatures, which takes longer, but preserves more of the natural milk enzymes and proteins that are largely destroyed in normal, commercially produced milk, this also means the cream rises to the top just like Grandma's used to! Make sure you give your bottle a good shake before you gulp it down! We offer A2 Milk and related dairy products. Just look for the symbol on our label! A2 is a natural protein found in selected cows. A2 is known as the ORIGINAL milk protein. The other natural protein found in cows is the A1 gene. The A1 protein evolved as a gene mutation over centuries of breeding. At Lahmers Farm and Buckeye Country Creamery, we DNA test our beautiful Bovines to know which cows produce the A2 protein in their milk. This A2 Milk is known to be easier on your digestive tract and have a multitude of other natural health benefits. Many who normally cannot drink milk without a negative side effect can drink our exclusive A2 Milk! Welcome to Buckeye Country Creamery!